I took pleasure in running the Louisville Sports Commission Half Marathon this morning. This distance was out of the question for me this time last year. Being two weeks post marathon, my goal was to complete and not to compete. It was refreshing to have a race in my backyard with no traveling and a sense of familiarity with the course. The smaller field of 2,300 runners gave it a relaxing atmosphere. The LSC half has a big race feel from start to finish. I took advantage of the gear check. I thought several of the runners were over dressed. That proved to be true from the complaints I heard of people over heating and seeing layers peel off. I took my time getting to the starting corral and ended up towards the end. No pressure. No worries. My first mile split was 8:05 and I told myself to slow it down and enjoy the moment. Second mile split was 8:17 and that was still too fast. Finally, I see a 2 hour pace group courtesy of Fleet Feet Sports. I joined the party and settled into about a 9:00 avg pace. The course took us through Cherokee Park which is known for it’s killer hills. Surprisingly, they went by with ease. Next, was the pass through Cave Hill Cemetery which was a new addition to this year’s race. This was my first time in there and I was blown away by the cemetery’s grandeur. The gravestones and monuments reminded me of giant chess pieces. I wanted to see Col. Harland Sander’s gravesite but it was not along the route. Once we made it out the cemetery we were in my stomping ground of the Highlands. A group of teens were performing Michael Jackson’s Thriller. How cute! I grabbed water from every stop even though I didn’t feel like I needed it. I didn’t want to take any chances on dehydration. We all fought a brisky wind for majority of the race. At mile 10, I was feeling peppy and decided to break loose on the final 5k. My confidence was high. I picked neon shirts to pass and gradually passed them. I dropped from 9 to 8 minute miles. I am happy to report my final mile split was 7:07. I was rocking and rolling. This lady called my bib number and told me how good my form looked. A D.J. blasted MJ’s “Don’t Stop ‘Til You Get Enough. ” Perfect timing on that jam. The finish chute was right there and I finished strong! The M.C. announced my name which has never happened to me. I took my finisher’s photo and a lady came up to hug me. Off to the Belvedere party area and I realized I didn’t stop my Garmin. It read: 1:53, 13.24 miles, 8:36 avg pace, and1557 calories burned. I enjoyed a Panera bagel, chocolate milk and fruit for quick recovery. It’s official. The 13.1 is my favorite race distance. 5ks are good for speed work. Marathons drain the heck out of you. 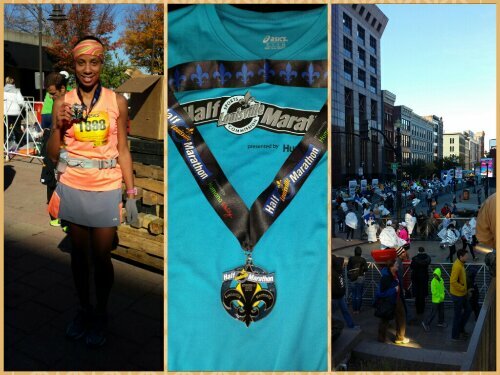 Half marathons are perfect for me to keep a healthy and active lifestyle. 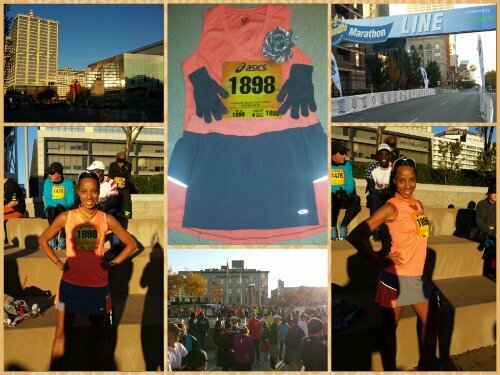 This entry was posted in Louisville, running and tagged half marathon. Bookmark the permalink. Fantastic! Looks like it was a scenic and fun race and you killed it! Love your outfit, oh-so-cute! That’s the Detroit in me always wanting to dress fly! Thank you! I can’t wait to see the difference with added strength training. Congrats! Very cool medal! I also enjoy half’s, but last year I ran my first 10 mile race and that was cool too! Thank you! The metal is a new design. The older medals were all unique because they were dipped in the Makers Mark sealing wax. The Fleur Di Lis is the symbol of Louisville. Cave Hill Cemetery is my favorite place to go. I used to go in there all the time and take pictures of the monuments and stones. When my sister was in town last weekend, I took her over to see Colonel Sanders. It’s SO beautiful in there. I need to go back and take a tour.